Herring Gull (Larus argentatus). Taken at Fishguard, Pembrokeshire, on May 8th 2014. Taken at Fishguard, Pembrokeshire, on May 8th 2014. 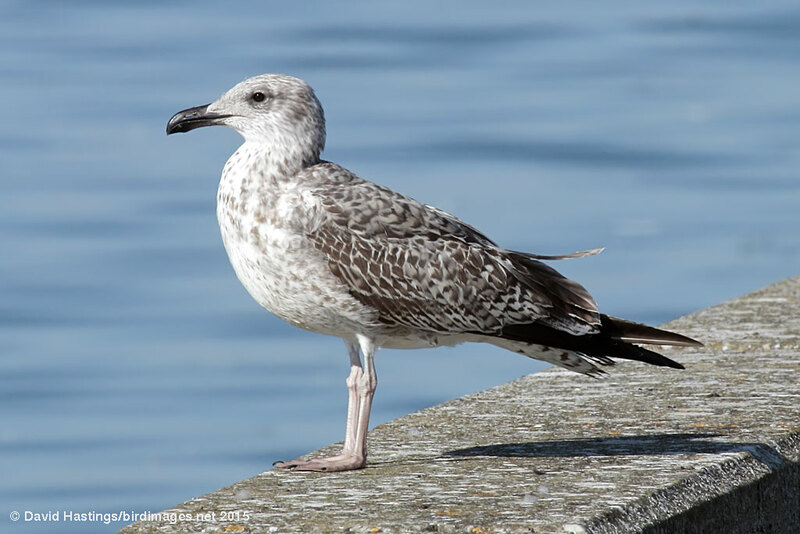 Herring Gull (Larus argentatus). Taken on Bryher, Isles of Scilly on April 19th 2011. Taken on Bryher, Isles of Scilly on April 19th 2011. Herring Gull (Larus argentatus). 2nd summer bird. Taken at Farmoor, Oxon., on May 13th 2018. 2nd summer bird. Taken at Farmoor, Oxon., on May 13th 2018. Herring Gull (Larus argentatus). 1st summer bird. Taken at Farmoor, Oxon., on September 6th 2015. 1st summer bird. Taken at Farmoor, Oxon., on September 6th 2015. 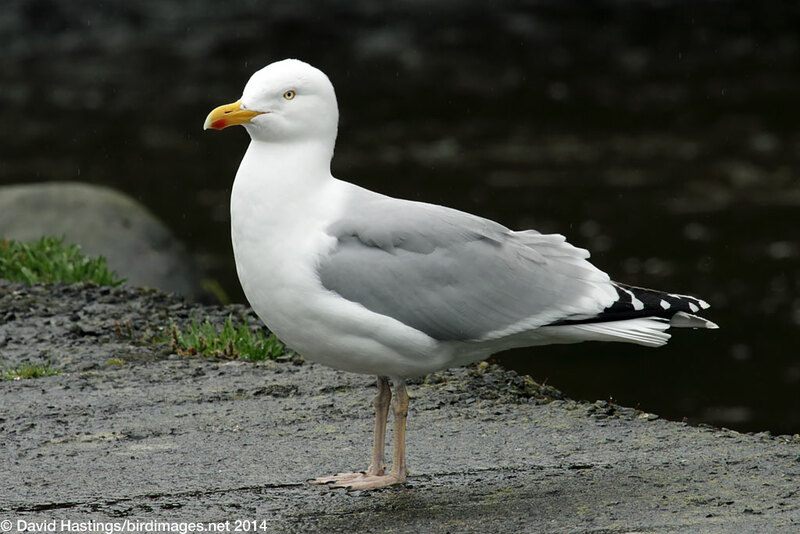 Herring Gulls have light grey backs, white under parts, and black wing tips with white 'mirrors'. Their legs and feet are pink, and they have heavy, slightly hooked bills marked with a red spot. They gain adult plumage at just over three years of age. Thus, for most of the year, four age-groups are recognizable, but during late summer a fifth age-group (newly fledged birds) can be seen. They can be found throughout the year around the coast, and inland around rubbish tips, fields, reservoirs and lakes, especially during winter. 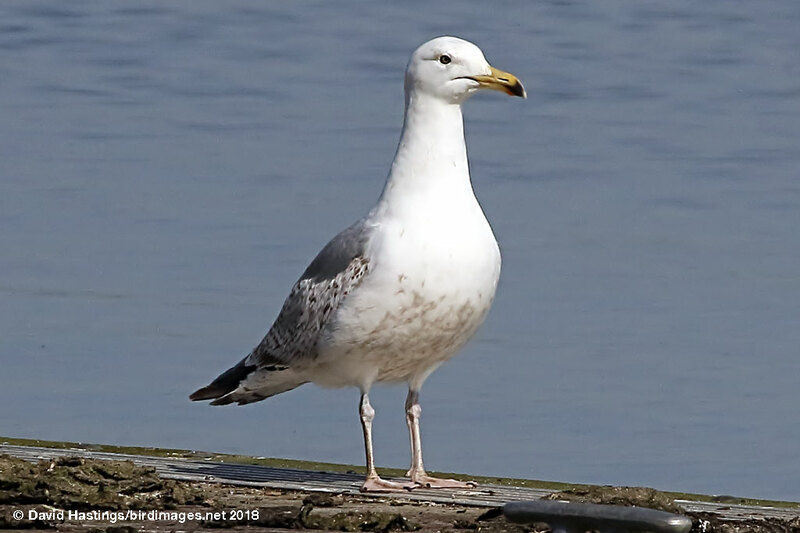 As with other gulls, the combination of inland reservoirs and rubbish dumps exactly suits their needs. 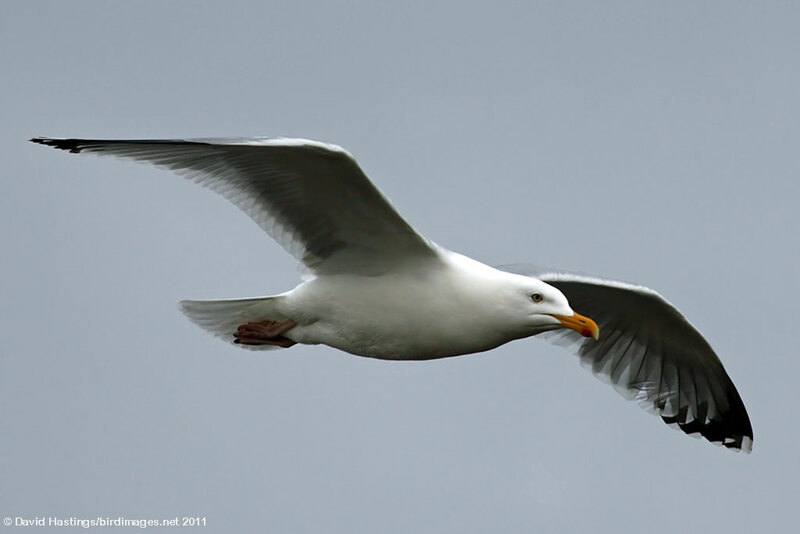 Herring Gulls often soar high up in stable air masses, sometimes in large parties. This species is on the amber list, as over half of their UK breeding population is confined to fewer than ten sites. About 139000 pairs breed in Britain, and around 380000 birds over-winter here.